Chics dig this car, we the people will cheer for this Auto, marauders will shake with fear by the sound of its Jet Turbine Engine because they know the Dark Knight has arrived, introducing the Legendary Auto Batmobile, the best of luck to all the supervillains out there because all the gadgets seen in the movie of this Batmobile Auto is fully functional, like the Spherical bombs could be deployed from its sides. An afterburner was housed in the back. 2 machine guns hidden behind flaps in each fender. 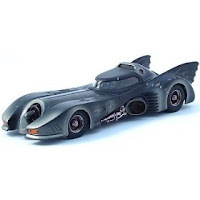 Its Grappling hook, once hooked on a structure, serves as an anchor to allow the Batmobile Auto to make an extremely sharp turn at high speed that its pursuers cannot follow. It has superhydraulics for course changes, a central "foot" capable of lifting the Auto and rotating it 180°, and a batdisc ejector side-mounted that could fire precisely 15 Batdiscs in 1-second pulse. Other gadgets of this Auto includes chassis-mounted shinbreakers, oil slick dispensers and smoke emitters. Inside, the two-seat cockpit features aircraft like instrumentation, a passenger side monitor, self-diagnostics system, CD recorder, and voice command recognition system. Pretty cool Auto ain't it, everything is fully functional even the Jet Turbine Engine, but it can only run approximately 15 seconds with the amount of fuel this Auto could carry, good enough to be captured and viewed in the movies. Now is there anyone out there who have the guts to be the Cape crusader? if there is one out there who has the heart to be the Dark knight, he must also possess the money amounting $500,000 to be able to avail his Batmobile.